I’ve decided it’s important to reach out to anybody and everybody who will listen to and learn from some of the experiences I’ve had recently with my horses. All of this experience was thrust upon me because of a wildfire situation where I had to evacuate 10 horses. I hope this information will spare you some of the angst I experienced because while all of my horses are currently fine and we escaped the fire (as of this moment) it was so extremely stressful. I hope you can learn from my experience. Now I’m one of those kinds of people who will avoid watching videos or bypass reading certain stories that I know are tragic, simply because it’s too painful to bear. What I’m presenting is not a tragedy, the animals in my stories are safe. So far I have been blessed, while there have been problems, all of the horses are okay, so I urge you to read the information here you so you can learn. Number 1 lesson. Train your horse to Trailer Load. I don’t care how long it takes. I don’t care about why it’s hard. If you start small and work a little daily (5 minutes) on the tasks and components you need to trailer load you will be prepared for an emergency. Trailer loading is not about making horse go in the trailer. Think of trailer loading as training a gazillion little components that will lead up to one long behavior chain. Most of the training can be done away from the trailer. Don’t have a trailer? 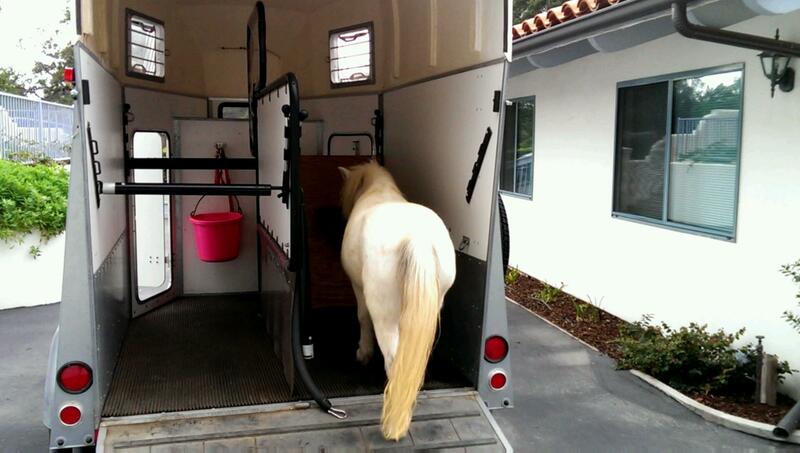 You don’t need one for the daily buildup of learning games that can prepare your horse for riding in a trailer. Break the components into small tasks and work them for 5 minutes a day. Using the stuff in your yard shape your horse to negotiate obstacles by backing over around and on top of them. Have your horse back towards platforms, planks or anything you can create. You can build small enclosed areas and practice in those. Practice backing into your stall if you have one; just spend a little time working with something that will help your horse get accustomed to moving all four feet with precision around obstacles. Please. Once backing is easy it’s pretty simple to teach the horse to move forward on the platforms and items that you’ve already been using for backing. 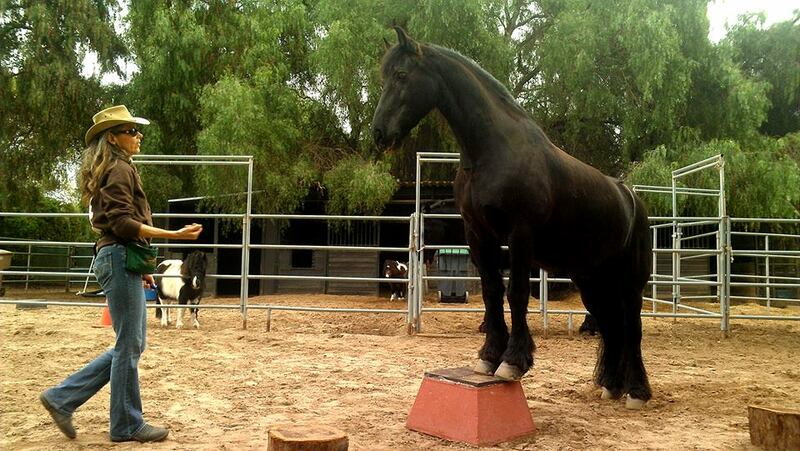 It’s about training a horse that food reinforcers happen when they move their feet. Front or back feet, it doesn’t matter it’s just about being reinforced for moving the feet. The trailer really just becomes another obstacle after you’ve done your homework with these other easy items. 5 minutes a day will get you there. Please, I’m starting with this lesson because it’s the most critical. On the plus side, when we were evacuated from the second location someone actually haltered my full sized horses, loaded them and took them with the rest of the horses at that barn to the new site. Thankfully my full sized horses are easy loaders. On the down side, I know in some situations horses were left behind to suffer whatever fate awaited them because they hadn’t been trained to load in a trailer. Don’t be caught by this heartbreaking trap. I’m looking forward to sharing some of the other lessons and training situations I’ve learned through this process. Thanks for reading. Thanks for sharing this great information. I am sharing it and hope others really take your words to heart!! Absolutely true. The Bastrop wildfires taught us to not only teach our horses to load early, but to have a contingency plan for trailering multiple horses in an evacuation. So glad you are sharing this, Peggy. It is heartbreaking to leave horses behind. We sometimes had to resort to heavy force and danger to horses and ourselves in emergency trailer Ioading. This trauma can be prevented if people take responsibility and are proactive in trailer training their horses in a positive way. Many people bought trailers after the fires, too. It is tough to have to wait to be evacuated. Guilty. Tem flat refuses to load. I would have to call in a friend to help for sure. But Stormy goes in great. Dash…..hummm… would he follow? Donkeys have to think it’s their own idea. 100% right though. You can’t move em out of harms way if they won’t load. Thanks for a great article.